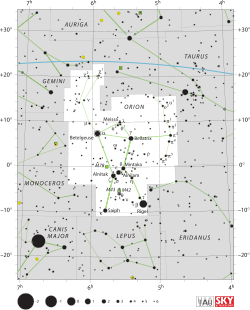 A constellation is formally defined as a region of the celestial sphere, with boundaries laid down by the International Astronomical Union (IAU). The constellation areas mostly had their origins in Western-traditional patterns of stars from which the constellations take their names. In 1922 the International Astronomical Union officially recognized the 88 modern constellations, covering the entire sky. They began as the 48 classical Greek constellations laid down by Ptolemy in the Almagest. Constellations in the far southern sky are late 16th- and mid 18th-century constructions. 12 of the 88 constellations compose the zodiac signs, though the astronomical positions of the constellations only loosely match the dates assigned to them in astrology. The term constellation can also refer to the stars within the boundaries of that constellation. Notable groupings of stars that do not form a constellation are called asterisms. When astronomers say something is “in” a given constellation they mean it is within those official boundaries. Any given point in a celestial coordinate system can unambiguously be assigned to a single constellation (but see Argo Navis). Many astronomical naming systems give the constellation in which a given object is found along with a designation in order to convey a rough idea in which part of the sky it is located. For example, the Flamsteed designation for bright stars consists of a number and the genitive form of the constellation name. The word "constellation" seems to come from the Late Latin term cōnstellātiō, which can be translated as "set of stars", and came into use in English during the 14th century. A more modern astronomical sense of the term is as a recognisable pattern of stars whose appearance is associated with mythological characters or creatures, or associated earthbound animals or objects. It also denotes 88 named groups of stars in the shape of stellar-patterns. 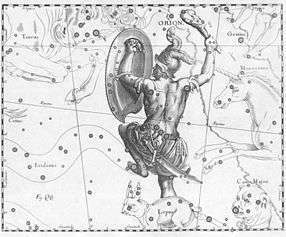 The Ancient Greek word for constellation was "ἄστρον". Colloquial usage does not draw a sharp distinction between "constellation" in the sense of an asterism (pattern of stars) and "constellation" in the sense of an area surrounding an asterism. The modern system of constellations used in astronomy employs the latter concept. For example, the northern asterism known as the Big Dipper comprises the seven brightest stars in the IAU constellation (area) Ursa Major while the southern False Cross includes portions of the constellations Carina and Vela. The term circumpolar constellation is used for any constellation that, from a particular latitude on Earth, never sets below the horizon. From the North Pole or South Pole, all constellations south or north of the celestial equator are circumpolar constellations. In the equatorial or temperate latitudes, the informal term equatorial constellation has sometimes been used for constellations that lie to the opposite the circumpolar constellations. Depending on the definition, equatorial constellations can include those that lie entirely between declinations 45° north and 45° south, or those that pass overhead between the tropics of Cancer and Capricorn between declinations of 23½° north and 23½° south. They generally include all constellations that intersect the celestial equator or part of the zodiac. Usually the only thing the stars in a constellation have in common is that they appear near each other in the sky when viewed from the Earth. In galactic space, the stars of a constellation usually lie at a variety of distances. Since stars also travel on their own orbits through the Milky Way, the star patterns of the constellations change slowly over time. After tens to hundreds of thousands of years, their familiar outlines will become unrecognisable. The terms chosen for the constellation themselves, together with the appearance of a constellation, may reveal where and when its constellation makers lived. The big dipper, for example, appears in many cultures under different names, e.g. "Plough" is the name in the United Kingdom, parrot in the Maya civilization, and the Egyptians saw it as part of the thigh and leg of a bull. Professor John D. Barrow claimed that people who named constellations did not do so because they thought them to be looking like e.g. a plough, but the naming was symbolic instead for something associated with e.g. a plough. The earliest direct evidence for the constellations comes from inscribed stones and clay writing tablets dug up in Mesopotamia (within modern Iraq) dating back to 3000 BC. It seems that the bulk of the Mesopotamian constellations were created within a relatively short interval from around 1300 to 1000 BC. These groupings appeared later in many of the classical Greek constellations. The Babylonians were the first to recognize that astronomical phenomena are periodic and apply mathematics to their predictions. 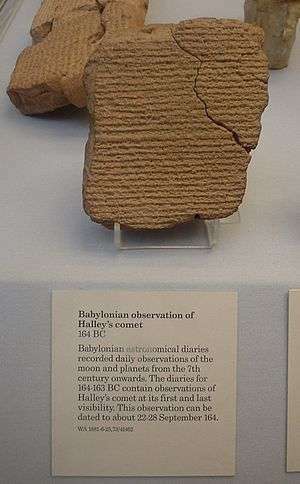 The oldest Babylonian star catalogues of stars and constellations date back to the beginning in the Middle Bronze Age, most notably the Three Stars Each texts and the MUL.APIN, an expanded and revised version based on more accurate observation from around 1000 BC. However, the numerous Sumerian names in these catalogues suggest that they build on older, but otherwise unattested, Sumerian traditions of the Early Bronze Age. The classical Zodiac is a product of a revision of the Old Babylonian system in later Neo-Babylonian astronomy 6th century BC. Knowledge of the Neo-Babylonian zodiac is also reflected in the Hebrew Bible. E. W. Bullinger interpreted the creatures appearing in the books of Ezekiel (and thence in Revelation) as the middle signs of the four quarters of the Zodiac, with the Lion as Leo, the Bull as Taurus, the Man representing Aquarius and the Eagle standing in for Scorpio. The biblical Book of Job also makes reference to a number of constellations, including עיש ‘Ayish "bier", כסיל chesil "fool" and כימה chimah "heap" (Job 9:9, 38:31-32), rendered as "Arcturus, Orion and Pleiades" by the KJV, but ‘Ayish "the bier" actually corresponding to Ursa Major. The term Mazzaroth מַזָּרוֹת, a hapax legomenon in Job 38:32, may be the Hebrew word for the zodiacal constellations. In ancient China astronomy has had a long tradition in accurately observing celestial phenomena. Star names later categorized in the twenty-eight mansions have been found on oracle bones unearthed at Anyang, dating back to the middle Shang Dynasty. These Chinese constellations are one of the most important and also the most ancient structures in the Chinese sky, attested from the 5th century BC. Parallels to the earliest Babylonian (Sumerian) star catalogues suggest that the ancient Chinese system did not arise independently. Classical Chinese astronomy is recorded in the Han period and appears in the form of three schools, which are attributed to astronomers of the Warring States period. The constellations of the three schools were conflated into a single system by Chen Zhuo, an astronomer of the 3rd century (Three Kingdoms period). Chen Zhuo's work has been lost, but information on his system of constellations survives in Tang period records, notably by Qutan Xida. The oldest extant Chinese star chart dates to that period and was preserved as part of the Dunhuang Manuscripts. Native Chinese astronomy flourished during the Song dynasty, and during the Yuan Dynasty became increasingly influenced by medieval Islamic astronomy (see Treatise on Astrology of the Kaiyuan Era). As maps were prepared during this period on more scientific lines they were considered as more reliable. A well known map prepared during the Song Period is the Suzhou Astronomical Chart prepared with carvings of most stars on the planisphere of the Chinese Sky on a stone plate; it is done accurately based on observations and has the suprnova of the year of 1054 in Taurus carved on it. Influenced by European astronomy during the late Ming Dynasty, more stars were depicted on the charts but retaining the traditional constellations; new stars observed were incorporated as supplementary stars in old constellations in the southern sky which did not depict any of the traditional stars recorded by ancient Chinese astronomers. Further improvements were made during the later part of the Ming Dynasty by Xu Guangqi and Johann Adam Schall von Bell, the German Jesuit and was recorded in Chongzhen Lishu (Calendrical Treatise of Chongzhen Period, 1628). Traditional Chinese star maps incorporated 23 new constellations with 125 stars of the southern hemisphere of the sky based on the knowledge of western star charts; with this improvement the Chinese Sky was integrated with the World astronomy. The Nakṣatras are the 27 or sometime 28 Indian lunar mansion – the divisions of the sky in along the ecliptic. Their names are related to the most prominent asterisms in the respective sectors. As with other traditions, the original application of astronomy was thus religious. Indian astronomy was influenced by Greek astronomy beginning in the 4th century BC and through the early centuries of the Common Era, for example by the Yavanajataka and the Romaka Siddhanta, a Sanskrit translation of a Greek text disseminated from the 2nd century. Indian astronomy flowered in the 5th–6th century, with Aryabhata, whose Aryabhatiya represented the pinnacle of astronomical knowledge at the time. Later the Indian astronomy significantly influenced medieval Islamic, Chinese and European astronomy. Other astronomers of the classical era who further elaborated on Aryabhata's work include Brahmagupta, Varahamihira and Lalla. An identifiable native Indian astronomical tradition remained active throughout the medieval period and into the 16th or 17th century, especially within the Kerala school of astronomy and mathematics. There is only limited information on indigenous Greek constellations, with some fragmentary evidence being found in the Works and Days of Greek poet Hesiod, who mentioned the "heavenly bodies". Greek astronomy essentially adopted the older Babylonian system in the Hellenistic era, first introduced to Greece by Eudoxus of Cnidus in the 4th century BC. The original work of Eudoxus is lost, but it survives as a versification by Aratus, dating to the 3rd century BC. The most complete existing works dealing with the mythical origins of the constellations are by the Hellenistic writer termed pseudo-Eratosthenes and an early Roman writer styled pseudo-Hyginus. The basis of western astronomy as taught during Late Antiquity and until the Early Modern period is the Almagest by Ptolemy, written in the 2nd century. In Ptolemaic Egypt, native Egyptian tradition of anthropomorphic figures representing the planets, stars and various constellations. Some of these were combined with Greek and Babylonian astronomical systems culminating in the Zodiac of Dendera, but it remains unclear when this occurred, but most were placed during the Roman period between 2nd to 4th centuries AD. The oldest known depiction of the zodiac showing all the now familiar constellations, along with some original Egyptian Constellations, Decans and Planets. Ptolemy's Almagest remained the standard definition of constellations in the medieval period both in Europe and in Islamic astronomy. 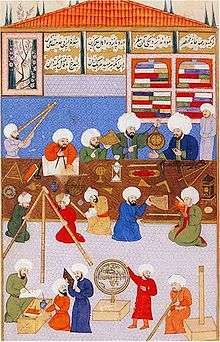 Particularly during the Islamic Golden Age (8th–15th centuries) the Islamic world experienced development in astronomy. These developments were mostly written in Arabic and took place from North Africa to Central Asia, Al-Andalus, and later in the Far East and India. It closely parallels the genesis of other Islamic sciences in its assimilation of foreign material and the amalgamation of the disparate elements of that material to create a science with Islamic characteristics. These included ancient Greek astronomy, Sassanid, and Indian works in particular, which were translated and built upon. In turn, Islamic astronomy later had a significant influence on Byzantine and European astronomy (see Latin translations of the 12th century) as well as Chinese astronomy and Malian astronomy. A significant number of stars in the sky, such as Aldebaran and Altair, and astronomical terms such as alidade, azimuth, and almucantar, are still referred to by their Arabic names. A large corpus of literature from Islamic astronomy remains today, numbering approximately 10,000 manuscripts scattered throughout the world, many of which have not been read or catalogued. Even so, a reasonably accurate picture of Islamic activity in the field of astronomy can be reconstructed. Globe from 1602 to represent the heavens made by Willem Blaeu (1571-1638). The skies around the South Celestial Pole are not observable from north of the equator and were never catalogued by the ancient Babylonians, Greeks, Chinese and Arabs. The modern constellations in this region were first defined during the age of exploration by Petrus Plancius, who used the records from observations of twelve new constellations made by the Dutch navigators Pieter Dirkszoon Keyser and Frederick de Houtman at the end of the sixteenth century. They were later depicted by Johann Bayer in his star atlas Uranometria of 1603. Several more were created by Nicolas Louis de Lacaille in his star catalogue, published in 1756. Some modern proposals for new constellations were not successful; an example is Quadrans, eponymous of the Quadrantid meteors, now divided between Boötes and Draco in the northern sky. The large classical constellation of Argo Navis was broken up into three separate parts (Carina, Puppis and Vela), for the convenience of stellar cartographers. The current list of 88 constellations recognized by the International Astronomical Union since 1922 is based on the 48 listed by Ptolemy in his Almagest in the 2nd century, with early modern modifications and additions (most importantly introducing constellations covering the parts of the southern sky unknown to Ptolemy) by Petrus Plancius (1592, 1597/98 and 1613), Johannes Hevelius (1690) and Nicolas Louis de Lacaille (1763), who named fourteen constellations and renamed a fifteenth one. De Lacaille studied the stars of the southern hemisphere from 1750 until 1754 from Cape of Good Hope, when he was said to have observed more than 10,000 stars using a 0.5 inches (13 mm) refracting telescope. In 1922, Henry Norris Russell aided the IAU (International Astronomical Union) in dividing the celestial sphere into 88 official constellations; Prior to this, Ptolemy's list of 48 constellations with many additions made by European astronomers had prevailed. However, these divisions did not have clear border between them. It was only in 1930 that Eugene Delporte, the Belgian astronomer created an authoritative map demarcating the areas of sky under different constellations. Where possible, these modern constellations usually share the names of their Graeco-Roman predecessors, such as Orion, Leo or Scorpius. The aim of this system is area-mapping, i.e. the division of the celestial sphere into contiguous fields. Out of the 88 modern constellations, 36 lie predominantly in the northern sky, and the other 52 predominantly in the southern. In 1930, the boundaries between the 88 constellations were devised by Eugène Delporte along vertical and horizontal lines of right ascension and declination. However, the data he used originated back to epoch B1875.0, which was when Benjamin A. Gould first made his proposal to designate boundaries for the celestial sphere, a suggestion upon which Delporte would base his work. The consequence of this early date is that because of the precession of the equinoxes, the borders on a modern star map, such as epoch J2000, are already somewhat skewed and no longer perfectly vertical or horizontal. This effect will increase over the years and centuries to come. An asterism is a pattern of stars recognized in the Earth's night sky and may be part of an official constellation. It may also be composed of stars from more than one constellation. The stars of the main asterism within a constellation are usually given Greek letters in their order of brightness, the so-called Bayer designation introduced by Johann Bayer in 1603. A total of 1,564 stars are so identified, out of approximately 10,000 stars visible to the naked eye. The brightest stars, usually the stars that make up the constellation's eponymous asterism, also retain proper names, often from Arabic. For example, six of the seven stars making up the Little Dipper asterism of the constellation Ursa Minor have proper names, viz. Polaris (α UMi), Kochab (β UMi), Pherkad (γ UMi), Yildun (δ UMi), Ahfa al Farkadain (ζ UMi) and Anwar al Farkadain (η UMi). The stars within an asterism rarely have any substantial astrophysical relationship to each other, and their apparent proximity when viewed from Earth disguises the fact that they are far apart, some being much farther from Earth than others. However, there are some exceptions: almost all of the stars in the constellation of Ursa Major (including most of the Big Dipper) are genuinely close to one another, travel through the galaxy with similar velocities, and are likely to have formed together as part of a cluster that is slowly dispersing. These stars form the Ursa Major moving group. The idea of dividing the celestial sphere into constellations, understood as areas surrounding asterisms, is early modern. The currently used boundaries between constellations were defined in 1930. The concept is ultimately derived from the ancient tradition of dividing the ecliptic into twelve equal parts named for nearby asterisms (the Zodiac). This defined an ecliptic coordinate system which was used throughout the medieval period and into the 18th century. Systems of dividing the ecliptic (as opposed to dividing the celestial sphere into constellations in the modern sense) are also found in Chinese and Hindu astronomy. In classical Chinese astronomy, the northern sky is divided geometrically, into five "enclosures" and twenty-eight mansions along the ecliptic, grouped into Four Symbols of seven asterisms each. Ecliptic longitude is measured using 24 Solar terms, each of 15° longitude, and are used by Chinese lunisolar calendars to stay synchronized with the seasons, which is crucial for agrarian societies. In Hindu astronomy, the term for "lunar mansion" is nákṣatra In Vedanga Jyotisha, which is derived from the Rik and Yajur Jyotisha treatises, and is dated before 1600 B.C, the zodiac is divided into 27 nákṣatras, each nakshatra covering 13° 20'; however, Abhijit the 28th nakshatra was excluded from this treatise though its was initially one of the 28 parts of the ecliptic. Later with the Siddhanta calendar of the zodiac system coming into vogue Vedanga Jyotisha became outdated. The Great Rift, a series of dark patches in the Milky Way, is more visible and striking in the southern hemisphere than in the northern. It vividly stands out when conditions are otherwise so dark that the Milky Way's central region casts shadows on the ground. Some cultures have discerned shapes in these patches and have given names to these "dark cloud constellations". Members of the Inca civilization identified various dark areas or dark nebulae in the Milky Way as animals, and associated their appearance with the seasonal rains. Australian Aboriginal astronomy also describes dark cloud constellations, the most famous being the "emu in the sky" whose head is formed by the Coalsack, a dark nebulae instead of the stars. ↑ "Definition of constellation in English:constellation". Oxford Dictionaries. Retrieved 2 August 2016. ↑ "constellation". Merriam-webster. Retrieved 2 August 2016. ↑ Autenrieth, Georg (1897). A Homeric Dictionary, for Schools and Colleges: ("ἄστρον"). New York: Harper & Brothers. p. 51. ↑ Steele, Joel Dorman (1884). "The story of the stars: New descriptive astronomy". Science series. American Book Company: 220. ↑ Harbord, John Bradley; Goodwin, H. B. (1897). Glossary of navigation: a vade mecum for practical navigators (3rd ed.). Portsmouth: Griffin. p. 142. ↑ "Do Constellations Ever Break Apart or Change?". NASA. Retrieved November 27, 2014. ↑ D. Barrows, John (25 January 2007). "The Origin of the Constellations". Gresham College. Retrieved 1 August 2016. Whether you live in the north or the southern hemisphere makes a big difference. In a typical representation of the northern constellations, you can see some familiar candidates: the Plough in the middle. The Plough is something that appears in many cultures. It is a group of seven stars. We call it the Plough, the Americans call it the Big Dipper, the Ancient Mayans called it a parrot, the Chinese represented it as a chariot, the Egyptians as part of the thigh and leg of a bull, so everybody sees things differently. You should not take very seriously the idea that people who named these star patterns really did believe them to be looking like, say, a hunter or a plough. They were symbolic, almost certainly, for something associated with a hunter or a plough or whatever was being used as the image. ↑ Rogers, J. H. (1998). Origins of the ancient constellations: I. The Mesopotamian traditions. Journal of the British Astronomical Association, vol.108, no.1, pp. 9-28. 1 2 Schaefer, Bradley E. (2006). "The Origin of the Greek Constellations". 295: 96–101. doi:10.1038/scientificamerican1106-96. ↑ "History of the Constellations and Star Names — D.4: Sumerian constellations and star names?". Gary D. Thompson. 21 April 2015. Retrieved 30 August 2015. ↑ Xiaochun Sun, Jacob Kistemaker, The Chinese sky during the Han, vol. 38 of Sinica Leidensia, BRILL, 1997, ISBN 978-90-04-10737-3, p. 18, note 9. ↑ Xiaochun Sun, Jacob Kistemaker, The Chinese sky during the Han, vol. 38 of Sinica Leidensia, BRILL, 1997, ISBN 978-90-04-10737-3, chapter 2, 15-36. 1 2 3 Selin, Helaine Elise (12 March 2008). Encyclopaedia of the History of Science, Technology, and Medicine in Non-Western Cultures. Springer Science & Business Media. p. 2022. ISBN 978-1-4020-4559-2. ↑ Sun, Xiaochun (1997). Helaine Selin, ed. Encyclopaedia of the History of Science, Technology, and Medicine in Non-Western Cultures. Kluwer Academic Publishers. p. 910. ISBN 0-7923-4066-3. ↑ "Stars and Constellations in Homer and Hesiod". The Annual of the British School at Athens. 1951. ↑ Rogers, John H. (1998). "Origins of the ancient constellations: I. The Mesopotamian traditions". Journal of the British Astronomical Association. 108: 9–28. Bibcode:1998JBAA..108....9R. ↑ Zodiac of Dendera, epitome. (Exhibition, Leic. square). J. Haddon, 1825. ↑ Medupe, Rodney Thebe; Warner, Brian; Jeppie, Shamil; Sanogo, Salikou; Maiga, Mohammed; Maiga, Ahmed; Dembele, Mamadou; Diakite, Drissa; Tembely, Laya; Kanoute, Mamadou; Traore, Sibiri; Sodio, Bernard; Hawkes, Sharron (2008). "The Timbuktu Astronomy Project". In Holbrook, Jarita; Medupe, Rodney; Urama, Johnson. 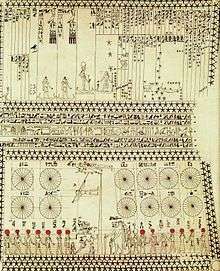 African Cultural Astronomy. Astrophysics and Space Science Proceedings. London: Springer. pp. 179–188. Bibcode:2008ASSP....6..179M. doi:10.1007/978-1-4020-6639-9_13. ISBN 978-1-4020-6638-2. ↑ Ilyas, Mohammad (1996). Islamic astronomy and science development : glorious past, challenging future. Malaysia: Pelanduk Publications. ISBN 9679785491. ↑ Ian Ridpath. "Bayer's southern star chart". ↑ Ian Ridpath. "Lacaille's southern planisphere". 1 2 "The Constellations". IAU—International Astronomical Union. Retrieved 29 August 2015. ↑ Ian Ridpath. "Constellation names, abbreviations and sizes". Retrieved 30 August 2015. ↑ Ian Ridpath. "Star Tales – The Almagest". Retrieved 30 August 2015. 1 2 "Abbé Nicolas Louis de Lacaille (1713-1762)". Department of Astronomy. University of Wisconsin-Madison. Retrieved 1 August 2016. ↑ "The original names and abbreviations for constellations from 1922". Retrieved 2010-01-31. ↑ Marc Lachièze-Rey; Jean-Pierre Luminet; Bibliothèque Nationale de France. Paris (16 July 2001). Celestial Treasury: From the Music of the Spheres to the Conquest of Space. Cambridge University Press. p. 80. ISBN 978-0-521-80040-2. ↑ "Constellation boundaries.". Retrieved 2011-05-24. ↑ The Bright Star Catalogue lists 9,110 objects of the night sky which are visible to the naked eye (apparent magnitude of 6.5 or brighter). 9,096 of these are stars, all of them well within our galaxy. ↑ In Vedic Sanskrit, the term nákṣatra may refer to any heavenly body, or to "the stars" collectively. The classical sense of "lunar mansion" is first found in the Atharvaveda, and becomes the primary meaning of the term in Classical Sanskrit. The verbal root nákṣ means "to approach, come near". ↑ The Astrological Magazine. Raman Publications. 2003. p. 36. ↑ Abbhyankar, Abbhyankar (1999). Astrophysics of the Solar System. Universities Press. p. 242. ISBN 978-81-7371-124-4. ↑ Lal, Mohan (1992). Encyclopaedia of Indian Literature: Sasay to Zorgot. Sahitya Akademi. p. 4520. ISBN 978-81-260-1221-3. ↑ Rao, Joe. "A Great Week to See the Milky Way". Space. Retrieved 5 January 2016. ↑ Bordeleau, André G. (22 October 2013). Flags of the Night Sky: When Astronomy Meets National Pride. Springer Science & Business Media. pp. 124–. ISBN 978-1-4614-0929-8. Rogers, John H. (1998). "Origins of the Ancient Contellations: I. The Mesopotamian Traditions". Journal of the British Astronomical Association. 108: 9–28. Bibcode:1998JBAA..108....9R. Rogers, John H. (1998). "Origins of the Ancient Contellations: II. The Mediterranean Traditions". Journal of the British Astronomical Association. 108: 79–89. Bibcode:1998JBAA..108...79R.